Four of us ventured out West this morning to enjoy the sights of Brule Road and to test the theory that the water should be warmer there than in the Lake. The result definitively proved the concept. 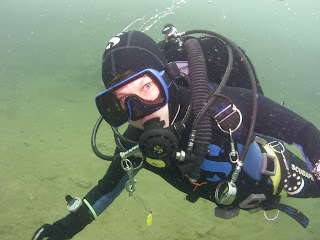 The water was 51F (11C) at the bottom and 57F (14C) for the first few feet. There was a definite thermocline or inversion effect operating at about 6-8 feet, which left a sort of silty cloud hanging over the divers. 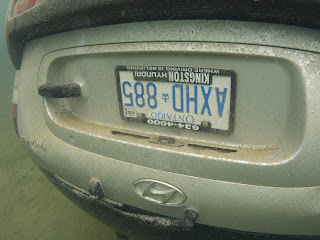 Nancy is pictured and a second image shows the back of the (now) famous Hyundai Santa Fe that arrived in the water over the Winter. Visibility was mildly disappointing - at about 25-30 feet, but the warmth more than made up for this..
Additional pictures from today's dive can be found on the Flickr site. Mike makes his Century.... this year! Algae Busting in Navy Bay..
Charter Season off to a great start..
Morton's Wharf and St Lawrence.. Warm work at Brewer's Mills..
Dead reckoning with the Deadman..
Two more dives...or maybe 1 1/2..
Chris turns 100 in Alexandria Bay..